Another “not the most exciting bird in the world” but interesting (to me) none the less. 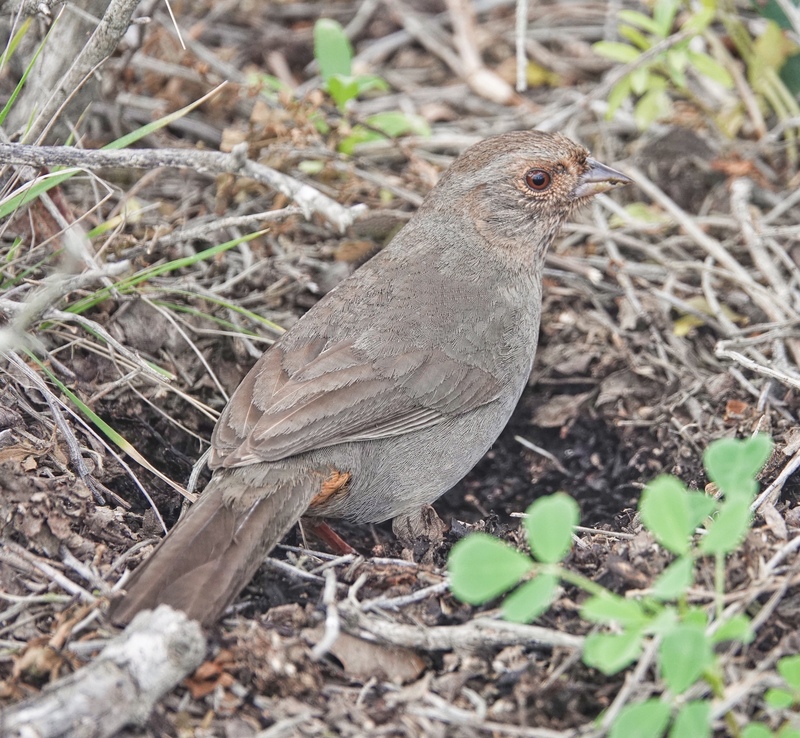 I can still remember when this was the Canyon Towhee, even in California…and the split gave me another life-bird 🙂 While Towhees in general are hard to see, due to their habit of skulking in the underbrush digging holes for grubs and worms (as this one is), the California Towhees at Cabrillo National Monument on the tip of Point Loma in San Diego California are parking lot birds, and very easy to see. I had to track this off the tarmac to get it in its more “native”, “natural” (and “characteristic”) habitat. Sony RX10iv at 600mm equivalent. Program mode with my custom birds and wildlife modifications. 1/250th @ f4 @ ISO 400. Processed in Polarr and TouchRetouch (that out-of-focus branch extended over the bird…a testimonial to the focus on the RX10iv, but not an attractive addition to the image. :). I started birding in western New Mexico, in the sage brush and ponderosa of the high dry country around Gallup, and we got Horned Larks at the edge of our local soccer field, in open areas around lakes, and in the sandy plains west of Zuni. 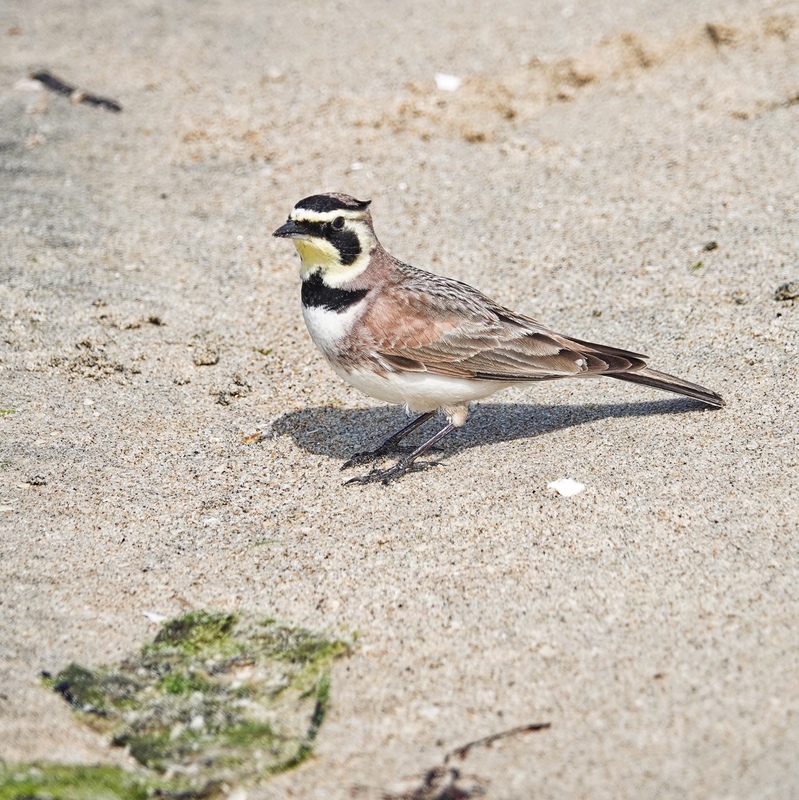 In San Diego, around Mission Bay, they are beach birds. I have seen them on both sides of the water between Sea World and Fiesta Island. They are bold, and if you stand still, they are likely to end up feeding only a few feet from your feet, as this one did on Fiesta Island. Sony RX10iv at 600mm equivalent. Program mode with my custom birds and wildlife modifications. 1/800th @ f4 @ ISO 100. Processed in Polarr. We went for a hike one morning in San Diego at Tecolote Canyon Natural Park, an “urban canyon” park with miles of trails just east of Sea World bordering the University of San Diego. It was a dull morning, overcast, but there was some bird activity, including this perky Bewick’s Wren. 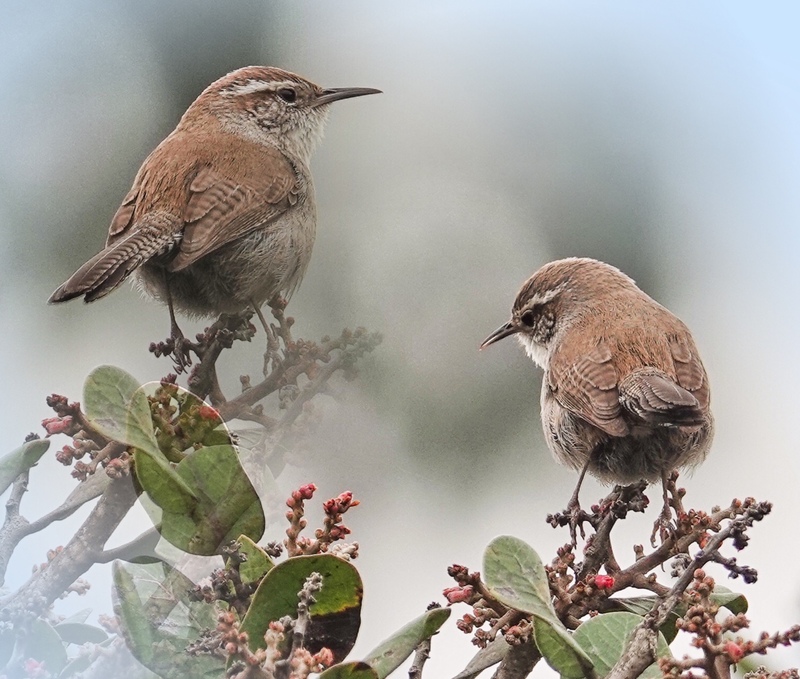 This is not two birds in one bush…it is one bird photographed twice and laid into the same frame using a blended collage effect in FrameMagic…just to give you a more comprehensive view of the bird 🙂 Sony RX10iv at 600mm equivalent. Program mode with my custom birds and wildlife modifications. 1/640th @ f4 @ ISO 100. Each image was processed in Polarr and cropped to about a 1200mm equivalent field of view before assembling in FrameMagic. Sometimes the beauty is in the small stuff…and in the small details. In all the great flower show of the beginnings of an Anza Borrego Desert superbloom, this tiny flower caught my eye. 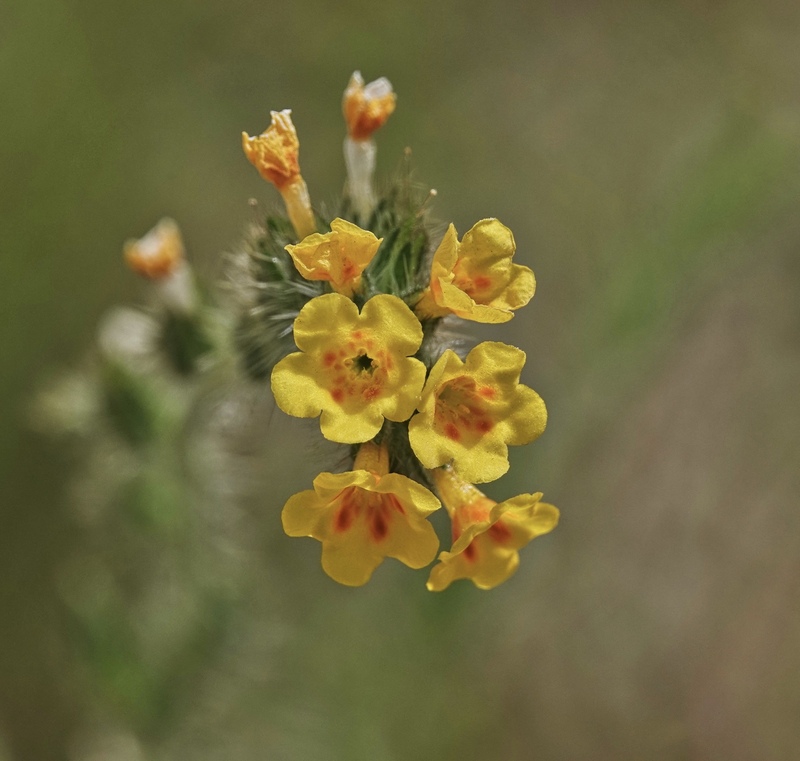 I think it is Bristly Fiddleneck, but there are several possible Fiddlenecks that grow in the Anza Borrego, and I would not be too surprised if it were one of the others. 🙂 I am not an expert. I found it coming back down the Hellhole Canyon Trail at Anza Borrego Desert State Park, near the end of our March 4th flower adventure. Sony RX10iv at 600mm equivalent. Macro mode. 1/1000th @ f5 @ ISO 100. -.3EV. Processed in Polarr. I actually like Scrub Jays. Gregarious and friendly. Noisy. Bold. We don’t have them in Maine, so I enjoy my encounters with them in Florida, where they are rare enough to go looking for, and in the Southwest where they are very common in the sage brush and Ponderosa. Sometime when I was not looking, the powers that be renamed my familiar Western Scrub Jay (I lived in New Mexico among the jays for 12 years) to the Woodhouse’s Scrub Jay. 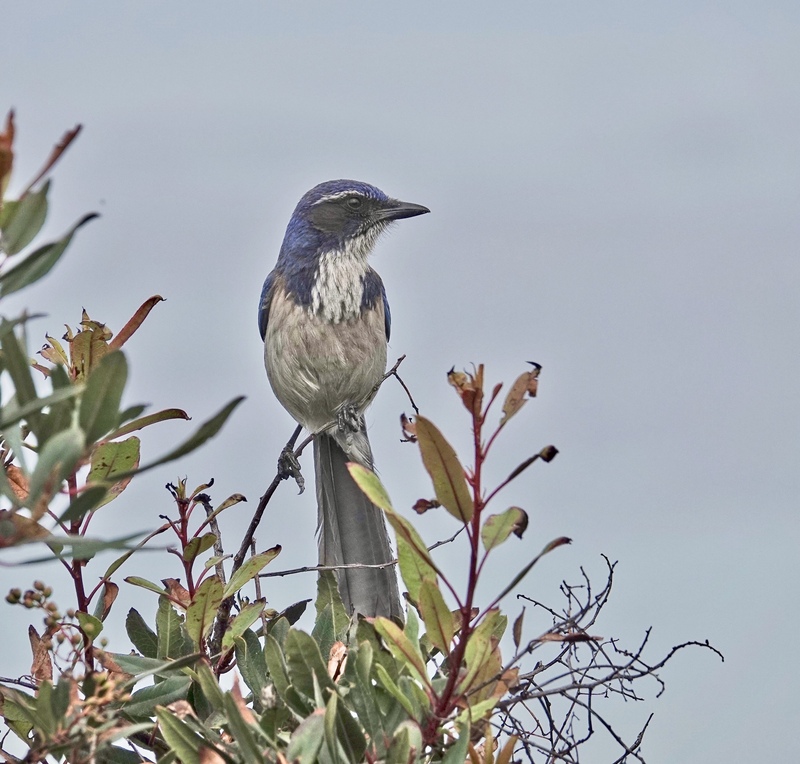 I am not sure I would have liked it as well under that name 🙂 This is the California Scrub Jay, the other survivor of that ornithological committee split. I only see these when visiting San Diego on my once a year pilgrimage to the San Diego Birding Festival, and it is always a treat. This one was way out on the tip of Point Loma, at Cabrillo National Monument. Sony RX10iv at 600mm equivalent. Program mode with my custom birds and wildlife modifications. 1/1000th @ f5.6 @ ISO 100. Processed in Polarr. 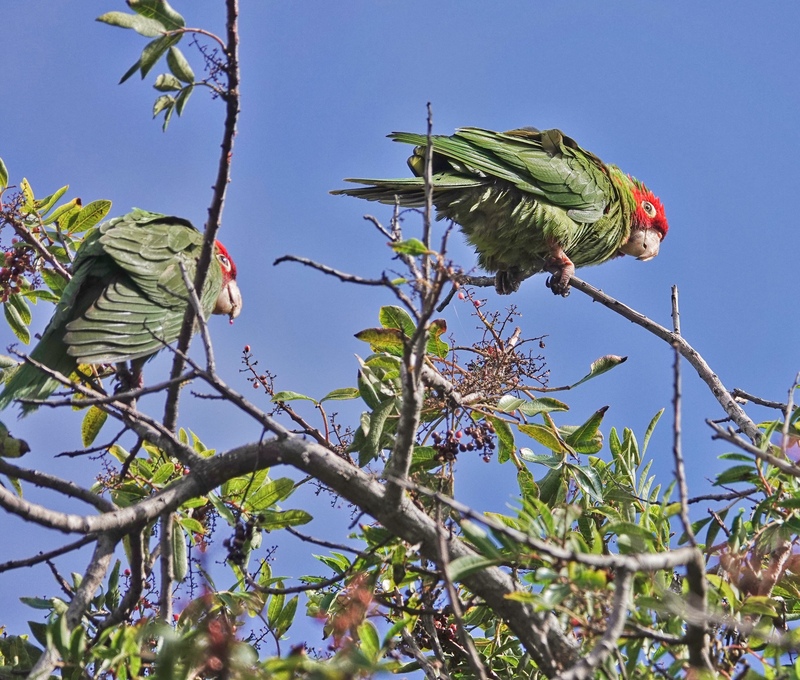 The Red-masked Parakeet is endangered in its home range in Ecuador and Peru, but it is doing very well in California. Feral populations are thriving around San Diego and San Francisco. It was imported, breed, and sold as a cage bird known as the Cherry-headed Conure for many years. There are also established populations in south Florida, in the larger Miami area. These birds came daily, in a flock of more than a dozen, to the pepper tree in the courtyard of the Marina Village Conference Center during the San Diego Birding Festival at the end of February, into March, where they were photographed by a few hundred eager bird photographers attending the event. The feral Parrots and Parakeets for southern California are becoming a “thing” among birders. They even have their on conservation organization and web site :). Sony RX10iv at 600mm equivalent. Program mode with my custom birds and wildlife modifications. 1/1000th @ f4.5 @ ISO 100. Processed in Polarr. 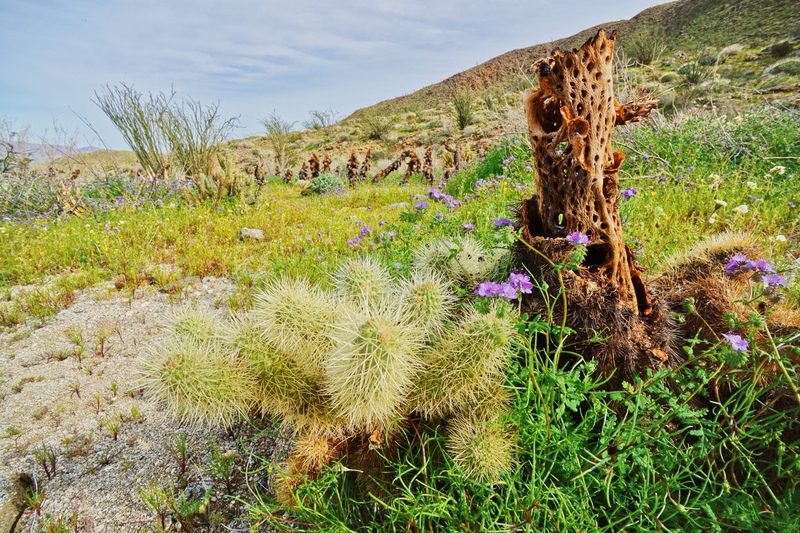 We hiked part way up Hellhole Canyon in Anza Borrego Desert State Park when we went wildflower hunting there in early March. This is a mixed stand of Parish’s Poppy (yellow), Wild Canterbury Bells (purple), and Biglow’s (or maybe Red-stemmed) Monkey Flower (pink). Simply wonderful! In-camera HDR. Sony a5100 with the Sony 16mm f2.8 lens and the UWA converter for an 18mm equivalent field of view. Processed in Polarr. 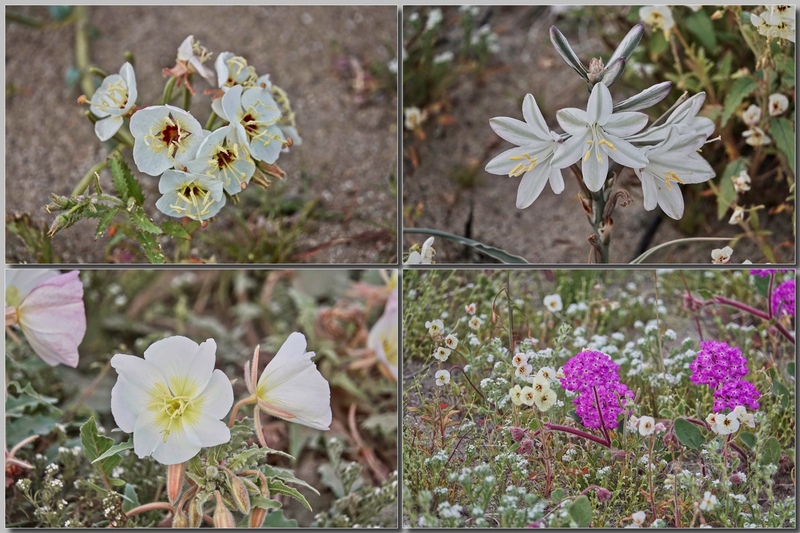 Brown-eyed Primrose, Desert Lily, California Evening Primrose, Mix with Sand Verbina and Primrose. We arrived in Borrego Springs late Sunday, after sunset, but we could not resist driving up Di Giorgio Road beyond Henderson Canyon Road to were the pavement ends to see the wildflower fields of the first of the superbloom. These shots were taken in the fading light. Brown-eyed Primrose is one of the most common Anza Borrego Desert wildflowers at lower elevations. Desert Lily can be found in isolated patches off Di Giorgio Road, (Coyote Canyon) and we found them the next morning out along S22 near Arroyo Salado Campground. I am sure they are other places as well. We found Evening Primrose wherever there were flowers. And finally a mixed stand of Brown-eyed Primrose, Sand Verbena, and maybe one of the popcorn flowers? Sony RX10iv at 600mm and 400mm equivalents. Macro mode. 1/250th @ f4 @ ISO 100-250. Processed in Polarr and assembled in FrameMagic. 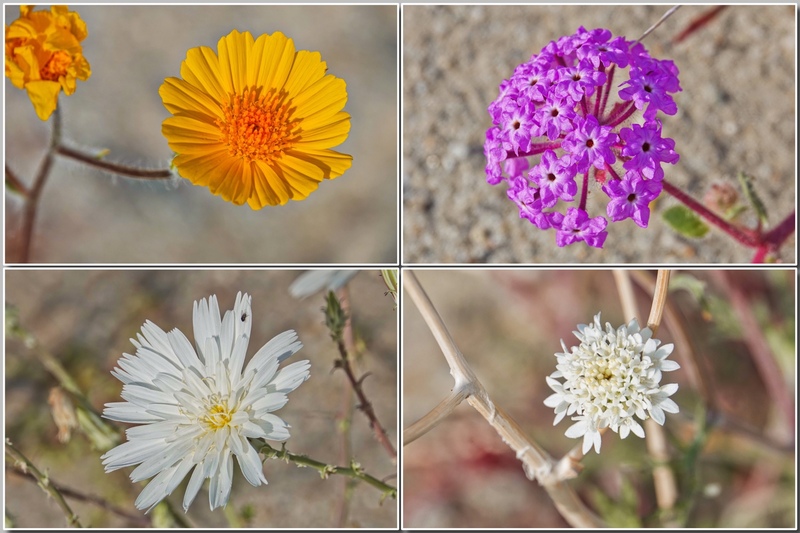 It is time to share some desert wildflower closeups from our visit to the Anza Borrego Desert in southern California. These flowers were all found within a few feet of each other on the hillside between S22 and Truckhaven Trail just east of Borrego Springs (there is actually a pin there on google maps, with some photos of the wildflower bloom, courtesy of desertusa.com). 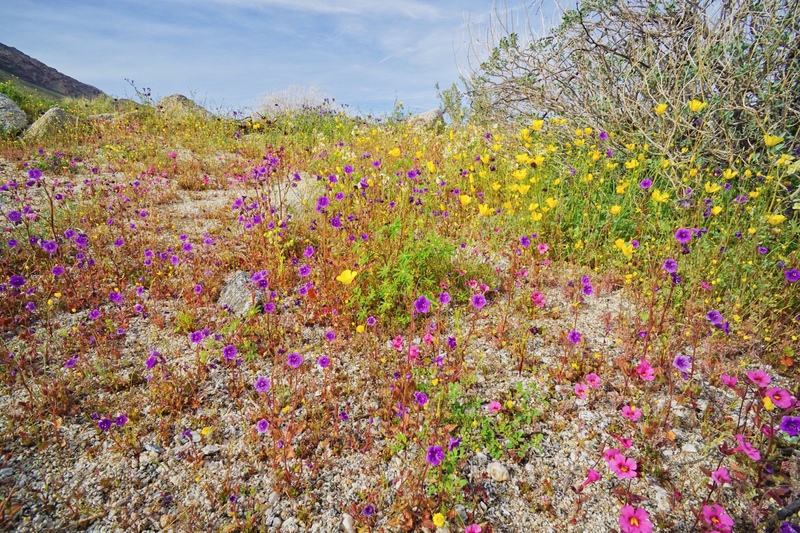 They are, clockwise from the upper left, Desert Sunflower, Sand Verbena, California Chicory, and Desert Pincushion. Sony RX10iv at 600mm. Macro mode. 1/1000th @ ISO 100 between f5 and f6.3. Processed in Polarr and assembled in FrameMagic.